The only hotel linked by covered walkway to the South Terminal at Gatwick Airport the hotel is 30 minutes from central London. All rooms have high-speed internet access. Family rooms sleep five and executive accommodation has Executive Lounge access. The Time to Fly package offers inclusive airport parking for pre-booked guests. All rooms are air-conditioned with high-speed internet access. 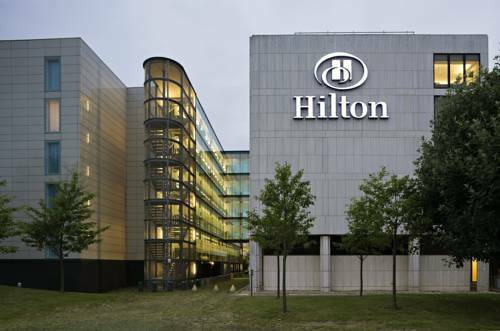 Try spacious Hilton Guest rooms or opt for Executive rooms, Relaxation rooms and Suites with Executive Lounge access. Relax with snacks, drinks or afternoon tea in the 24-hour Lobby Lounge. Visit our vibrant Garden Restaurant for Mediterranean specialties, or savour inspired international cuisine at Amy's Restaurant. The Livingwell Express gym is open 24 hours a day plus a choice of great golf. Stay in Executive rooms, Relaxation rooms or Suites for access to this private lounge, with express check-in and complimentary drinks and snacks. A spacious and vibrant setting for breakfast and evening buffet or Mediterranean-style a la carte dining. Set in the heart of the hotel in the daylight-flooded atrium, this 24-hour bar is the place to hobnob over a mid morning cafe latte and fruit muffin, or a cocktail in the evening. Let the hotel concierge take the hassle out of planning your leisure time. Use their services to book theatre tickets, golf tee times or plan family excursions. 24-Hour Front Desk, Airconditioning, All Public and Private spaces non-smoking, Bar,Elevator, Express Check-In/Check-Out, Gay Friendly, Heating, Luggage Storage, Newspapers, Non-Smoking Rooms, Parking, Pets Allowed, Restaurant, Rooms/Facilities for Disabled Guests, Safety Deposit Box, Ski Storage, Soundproofed Rooms. ATM/Cash Machine on site, Breakfast in the Room, Business Centre, Currency Exchange, Dry Cleaning, Fax/Photocopying, Internet Services, Laundry, Meeting/Banquet Facilities, Room Service, Souvenirs/Gift Shop. If cancelled up to 4:00 on the date of arrival, no fee will be charged. If cancelled later or in case of no-show, the first night will be charged. Visa, Master Card, American Express, Diners Card, JCB. Burstow Park Horse-riding Centre, 6 miles.